The Rockliffe series was recommended in THE TIMES! Are you a Georgette Heyer fan? Are you sad that she’s unlikely to write another Regency romance, on account of her having died in 1974? 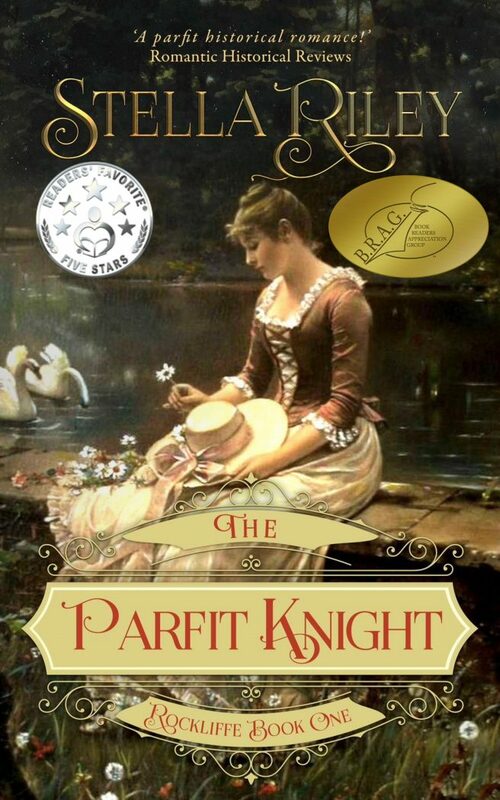 Well, I have exciting news: Stella Riley’s The Parfit Knight; honestly, it’s as good as Georgette. I read all five books in the series back to back on the way to work and loved them all. I finished the last one while actually walking over London Bridge, because I couldn’t put it down. Read it now. Thank me later. Wow! I certainly never expected this! Thank you – so sorry, I don’t know your name! It’s always a particular pleasure to hear from readers who have enjoyed the R&C series as well as Rockliffe. As you’re probably aware, I’ve been concentrating more on Rock & Co recently – book six, Cadenza, is almost completely written, though as always there will be a lot of editing required so it’s hard to predict a release date. My new hero, Julian Langham, is a harpsichord virtuoso. If you haven’t already found it, go to the Extras page for Jean Rondeau’s brilliant performance of one of Julian’s favourite pieces. And many thanks for all your kind comments. What Hilary Rose said is true ,they are terrific books and I read them all one after the other in about 3 days . Loved them and hope that there will be some more , because she is a very inventive writer . Also loved the civil war novels , which I have now read and hope to have some more to read . Please do keep on writing. Thanks, Elizabeth. So glad you’ve enjoyed the R&C books as well. I can see anyone reading them back to back they are so good. Thank you, Deborah. It was quite a surprise! that’s all very well and good but when is your next book arriving on our shelves! Soon, Marigold – hope so anyway. Sorry I can’t be more specific. Rock Six (Cadenza) will be finished when it’s finished. Previous Previous post: 3 in a row! It’s a hat-trick! Next Next post: HUZZAH! A B.R.A.G. Medallion for THE PLAYER!